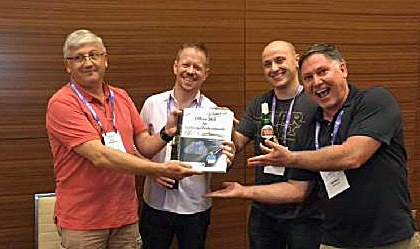 Yesterday, we seized the opportunity of having the three authors and our esteemed technical editor together for the IT/DEV Connections conference in Las Vegas to launch the second edition of “Office 365 for Exchange Professionals”. Binary Tree kindly sponsored a reception and once the 50 or so folks who came along had a drink, we shared some stories about the struggles of eBook publishing, especially when the subject matter changes so quickly, which is certainly the case with Office 365, and then distributed copies of the book on USB key that were also provided by Binary Tree. In the halcyon days of print publishing, a book launch was an opportunity for those who attended to get a copy of the book signed by the author. 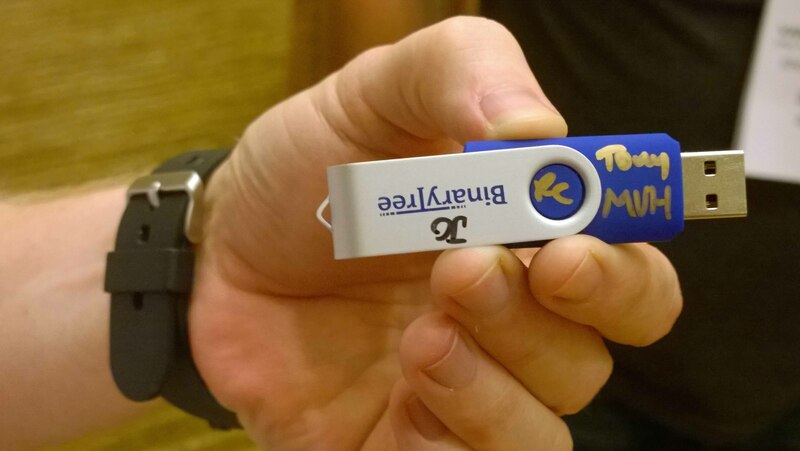 It’s pretty difficult to sign an eBook, but we came up with the idea of signing the USB key with a Sharpie. I have no idea of how long these signatures will last, but creating an assembly line to have the four of us sign each USB was a bit of fun. Binary Tree also printed off a paper copy of the book that we signed. 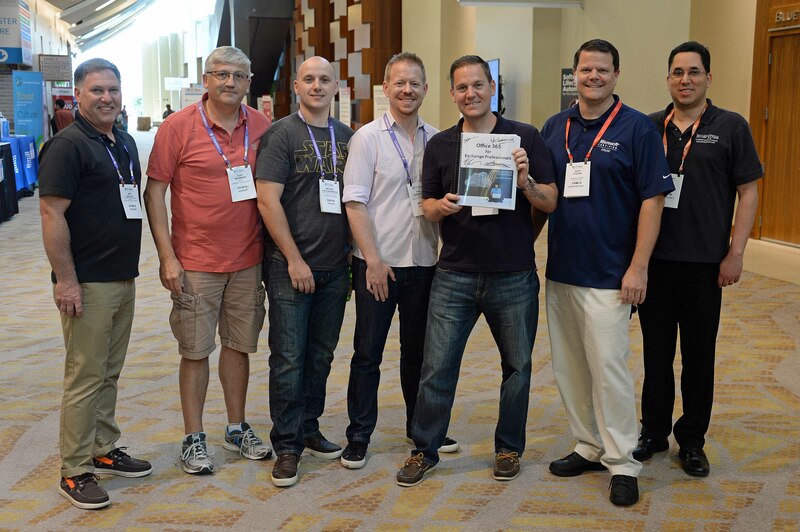 The photo below shows the writing team (Jeff Guillet, me, Michael Van Horenbeeck, Paul Cunningham) and three from Binary Tree, including Justin Harris and Gary Steere (both Exchange MVPs), and Val Vasquez. Those who weren’t able to attend IT/DEV Connections, which by the way is an excellent conference focused on practical issues involved in managing applications like Exchange, SharePoint, and Office 365, can now get the PDF and EPUB versions of the second edition at ExchangeServerPro.com. If you signed up to become a member of ExchangeServerPro.com and bought the first edition, you’re eligible to update to the second edition for $10. Otherwise the price is $38.20 until the end of September at which time the price will revert to $44.95. We are preparing a Kindle version too. The Kindle version of the second edition of “Office 365 for Exchange Professionals” is available for pre-order from Amazon and will be released on September 30. Some additional formatting work explains the delay in release. Unfortunately, we cannot offer a discount for the Kindle version for reasons that are too many and too boring to explain. Sorry. Alan Byrne, the co-founder of Cogmotive (an excellent reporting solution for Office 365), reviewed the second edition on his blog. It was great to have Alan read the book and tell us what he thinks because he has been living the dream of creating an ISV product for Office 365 and using tools like PowerShell and the Office 365 APIs to extract information from the service for the tenants he supports. As such, he knows what he is talking about. Of course, Office 365 doesn’t stop changing just because a new book is available. We know that we have work to do to keep pace with new updates, features and functionality that appear in Office 365. A third edition is planned and will probably appear in time for the Ignite 2016 conference next May. Thanks to everyone who supported the first edition; the second couldn’t have been possible without your help and feedback. And special thanks to Binary Tree for providing the necessary financial sponsorship to allow us to dedicate sufficient time to producing the second edition. We have over 150 pages of new content and have extensively revised many of the chapters from the first edition. That takes time, energy, and a little bit of money. 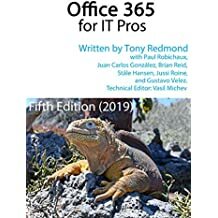 This entry was posted in Cloud, Email, Office 365 and tagged Binary Tree, ExchangeServerPro.com, IT/DEV Connections, Kindle version, Office 365 book, Office 365 for Exchange Professionals. Bookmark the permalink. If bought the first edition, you’re eligible to update to the second edition for $10. When to the website and logged on with my account. I didn’t see the $10.00 option, just the $38? Did you take out membership of the site? If you didn’t, we can’t track your eligibility for the update. I will DM you direct on this point.